If you own a business of any kind, you can join the NRA business alliance and combine shipping savings with FEDEX shipping. There are two simple steps to completion on line and both websites are posted here. The NRA costs $35.00 per year and inclusion in the FEDEX program is free. Supporting businesses that support your freedoms! This program has merit for a business owner. The NRA Business Alliance was established in 1992 to provide NRA member businesses with a marketplace to sell goods and services to fellow NRA members. The NRA’s Business Alliance web site, service directory, member magazines and promotions, and NRA member businesses reach nearly four million NRA members. 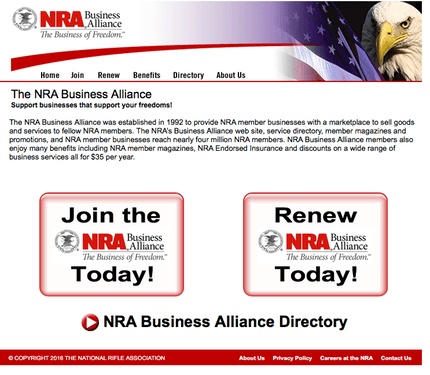 NRA Business Alliance members also enjoy many benefits including NRA member magazines, NRA Endorsed Insurance and discounts on a wide range of business services all for $35 per year. Just go to www.nraba.org and you’ll see this page. www.nraba.org. is the link for the NRA Business Alliance that a company can join that will allow them to utilize the agreement between NRA and FedEx. The process allows current NRA members who own any type of business to sign up for the NRA business alliance discount program. Fill out the form and check the benefits. The process should take around 10 days to be approved. Customers should note that if they already have a FFL that they currently use they can utilize them to ship firearms to us. The advantage to using this alliance between FedeX and the NRA is better rates and availability of services. FedEx and the NRA Business Alliance have teamed up to offer BIG savings on FedEx Express® and FedEx Ground® shipping, FedEx Freight® services and FedEx OfficeSM services. Simply enroll in theFedEx Advantage® programusing passcode FVMK8W13 or call 1-800-475-6708 for more information. Again, with FEDEX enrollment is free and there are no minimum shipping requirements to receive or maintain your discounts. To view a list of services available for firearm shipments, download the FedEx Services MatrixFor complete terms and conditions, please reference the Fedex Website if anything is unclear or any other questions you might have and any other benefits besides the discounts.